In amongst my sprawling and growing assortment of books is another collection, and one that takes up very little space. Arranged in two folders, red and green, are a number of banknotes. The red folder contains a currency that was never a currency, and the green contains one that should never have been. They are a tenuous, yet tangible, connection to the recent past. And their value to me is priceless. 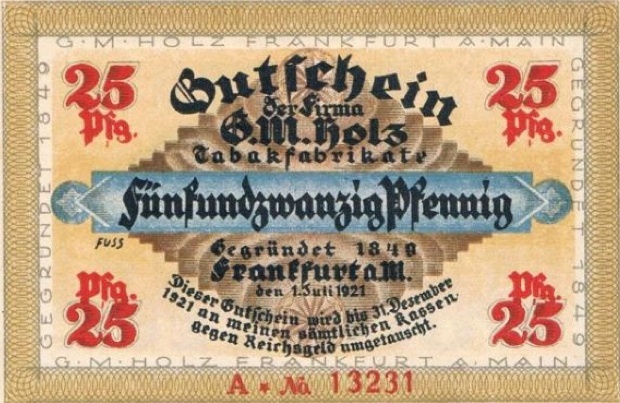 As early as 1914, when faced with the depreciation of the German Papiermark and the fact that the metal used to mint coins was worth more than the coins themselves, institutions that were unaffiliated with the German banks began printing a makeshift currency that could be used in certain specific locations within the towns of their origin. 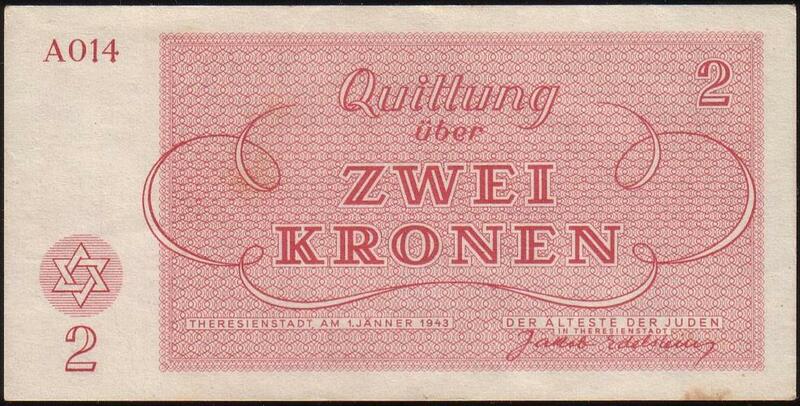 This currency has come to be known as Notgeld (“Necessity Money”), and it takes a variety of forms. Largely worthless at the time (although in some cases their usage did help to stimulate the economy), they quickly became an object for collectors. Some of them are exceptionally rare. 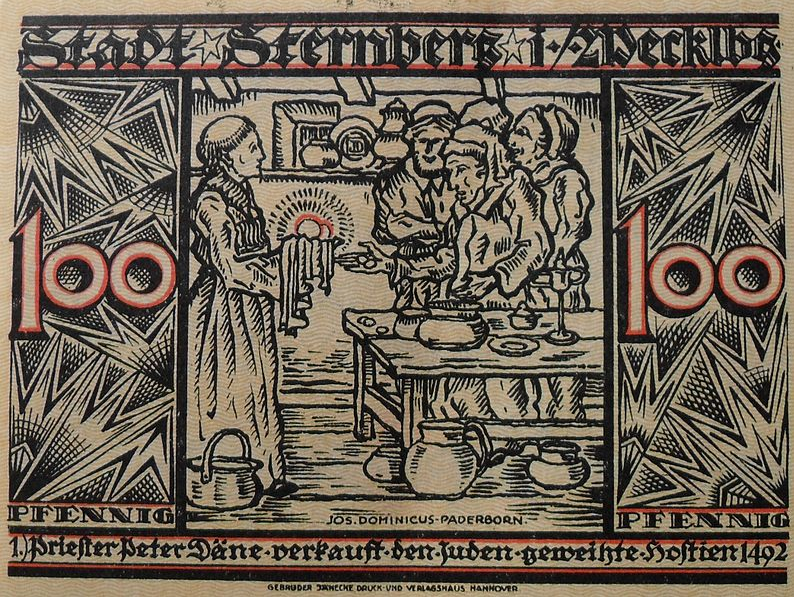 Given that they were of limited usage, and given the interest that people had in them as works of art, many institutions that produced this currency (be they hotels, or post-offices, or town councils) took the time to decorate them with motifs of religious or cultural value. 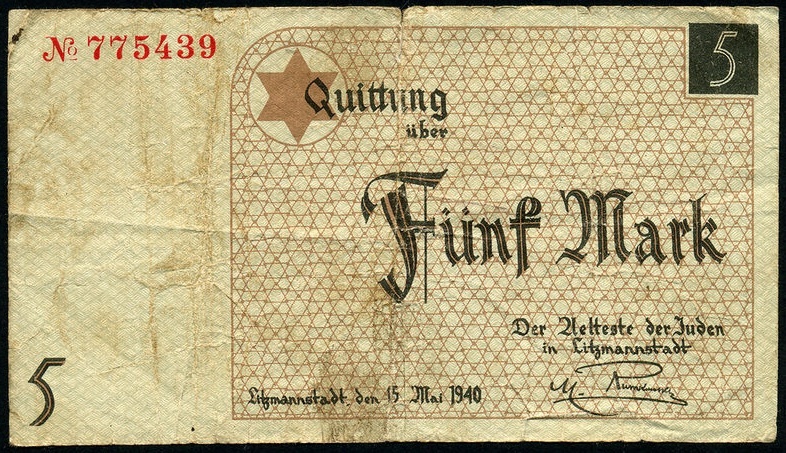 After the defeat of Germany in the Great War and the signing of the Treaty of Versailles, several of the Notgeld issued were of an antisemitic character. The following are the items (all uncirculated) that I have thus far collected. The inscription on the front tells of a [Jewish] man who suspended his youngest child out of the window to defecate, but to his surprise a councilman was walking by at the time. It concludes by noting that this was a “true story” (Wahrhaftige), which occurred in 1655. 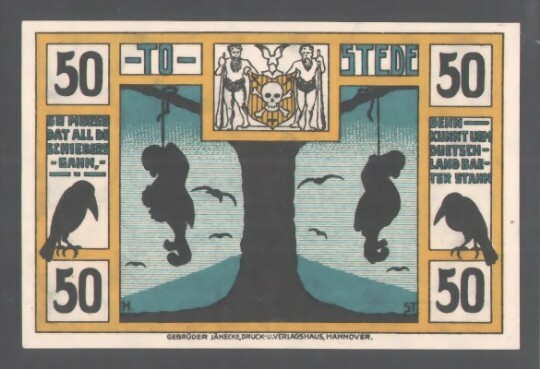 The front of the note depicts two Jews, hanged from a tree and surrounded by ravens. The German declares that “this should happen to all of the profiteers and Germany would be better off”. 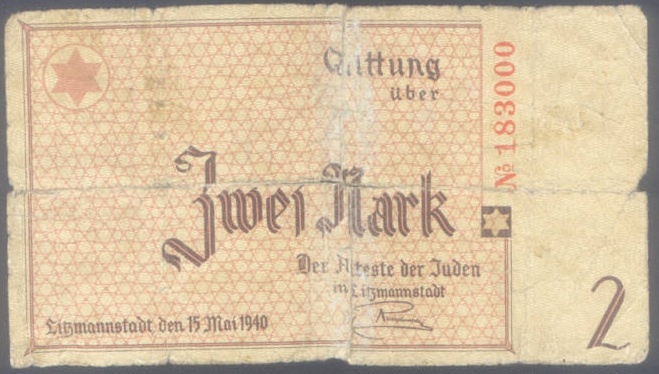 Presented in the style of the surrealists, this note depicts crooked and, in one case, possibly hornéd Jews. The symbol on the chest of the man in the foreground is possibly reminiscent of the communist hammer and sickle. Unlike the other items, there is nothing overtly antisemitic about this one, and it is only the historical context that makes of it something foreboding. 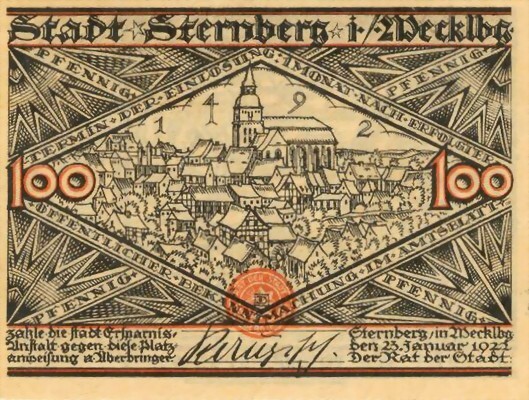 As they had done in Oranienberg as early as 1933, the Nazis introduced money to Theresienstadt concentration camp in 1943, and for much the same reason. A “model camp”, and one to which the Red Cross had access, it was important to carefully decorate the thin veneer of normalcy. In the infamous and unreleased propaganda film that the Nazis made of Theresienstadt, Jews can be seen lining up outside a bank, waiting to deposit their money. Depositing it in the bank was one of very few things that could actually be done with it, as a result of which they are almost all of them in uncirculated condition. 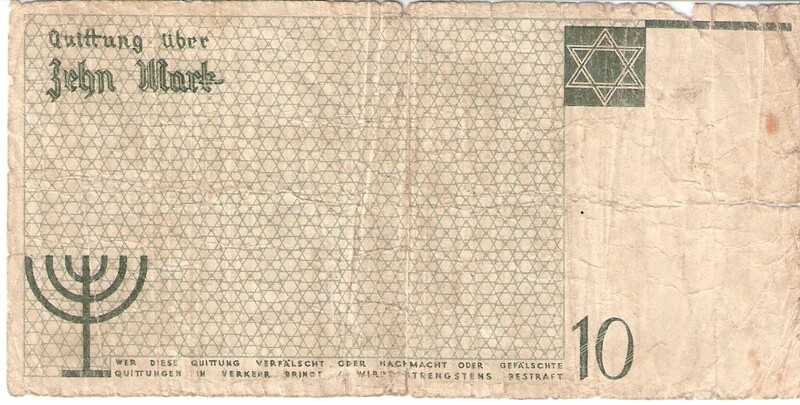 The designer of the notes was a Jew named Peter Kien, who was under instructions from Reinhard Heydrich to make the Moses on the banknotes look semitic, and to ensure that the sixth commandment (“Thou shalt not kill”) be excluded from the picture. This second stipulation has led to the erroneous claim that Moses’ hand is obscuring the sixth commandment. This claim can be found in Joel Forman, “Holocaust Numismatics” (1997), John Sandrock, “The Use of Banknotes as an Instrument of Propaganda” (2004) and Stephen Feinstein, “Art and Imagery of the Ghetto – During and After the Holocaust” (2005). Embarrassingly, this misinformation is even perpetuated by the Tauber Holocaust Library and Zachor, 2005: two sources whose authors I would expect to be more familiar with Hebrew. In actual fact, Moses’ hand is partially obscuring the fourth commandment (the letters כו of the word זכור can be glimpsed through his fingers, meaning that this version of the decalogue is the one found in Exodus 20), and completely obscuring the fifth (“Remember the Shabbat” and “Honour thy parents”, respectively). 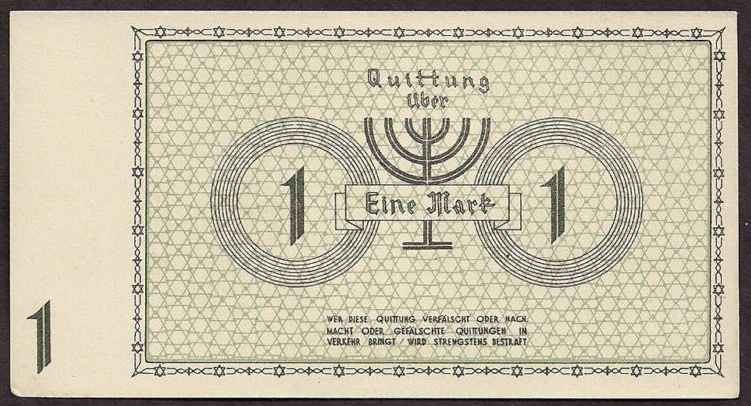 The Nazis wanted to get the money to circulate, but without a real value, the inmates did not see a lot of incentive in earning the money or spending it. 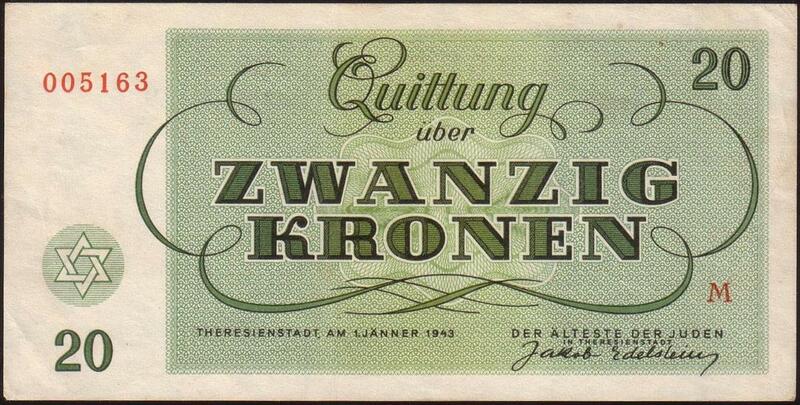 Everyone was required to save some of their wages, but ultimately there was nothing to spend them on. Shops were set up in which it was ostensibly possible to buy the items that had been confiscated from prisoners upon entering the ghetto. These items were priced so high, however, that the money was never really taken seriously. – Ray Feller and Steve Feller, Silent Witnesses: Civilian Camp Money of World War II (ed. J.E. Boling; 2007), 81. Unlike the notes from Theresienstadt, the notes from the Lodz ghetto are all thoroughly well-used. There, having a little money might mean the difference between life and death. 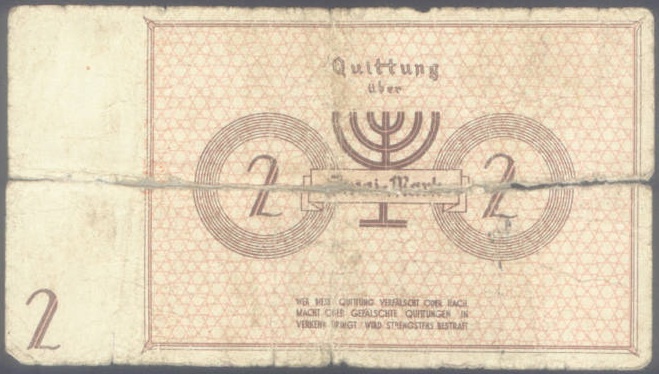 As is discussed in Ray and Steve Feller’s Silent Witnesses: Civilian Camp Money of World War II, providing the ghetto inmates with a currency of their own was but one of many ways in which the Nazis were able to reappropriate all of their property. Instead of simply stealing what they wanted, they purchased it from them and converted the money (minus a 30% tax) into the ghetto’s currency. Were somebody to escape, the currency would be useless to them outside the ghetto. Inside the ghetto, it was needed in order to survive. 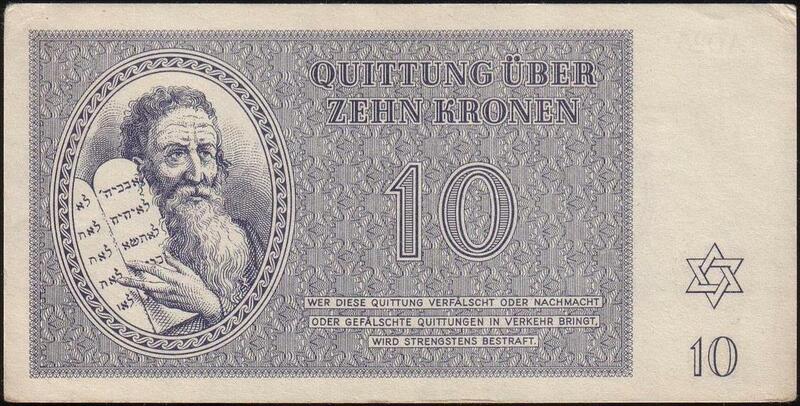 This item is a postage stamp, valued at 10 pfennig. 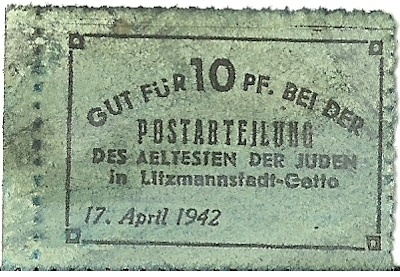 All such notes are dated either “17 April 1942” or “15 Mai 1944”, the latter date being within three months of the liquidation of the ghetto and the extermination of its remaining members. The following images are of the actual items that I purchased. They each feature the use of the menorah as an image, as well as that of the magen david – both by itself and in the form of barbed wire. Although it may be hard to see on the images below, each note also features an identifying mark that, together with its serial code, the nature of the printing and the fabric of the note, helps to identify counterfeits. The identifying mark is always on the face of each note; where I also have a photograph for the back of the note, the face of the note is shown first. 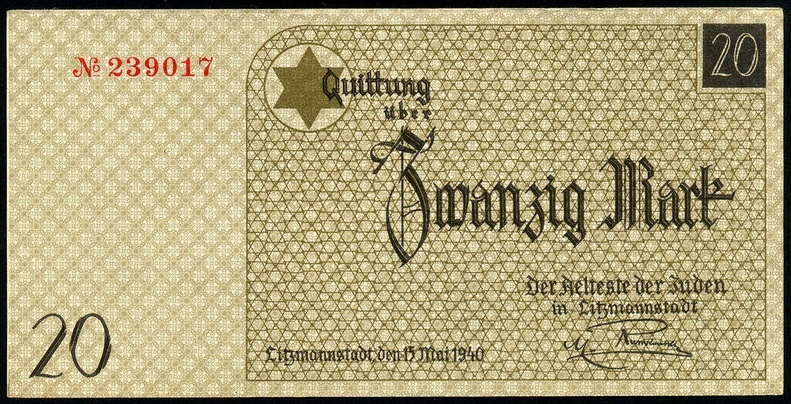 Each note also features the signature of the Elder of the Jews of Lodz Ghetto, the controversial Chaim Rumkowski, also printed on the face. 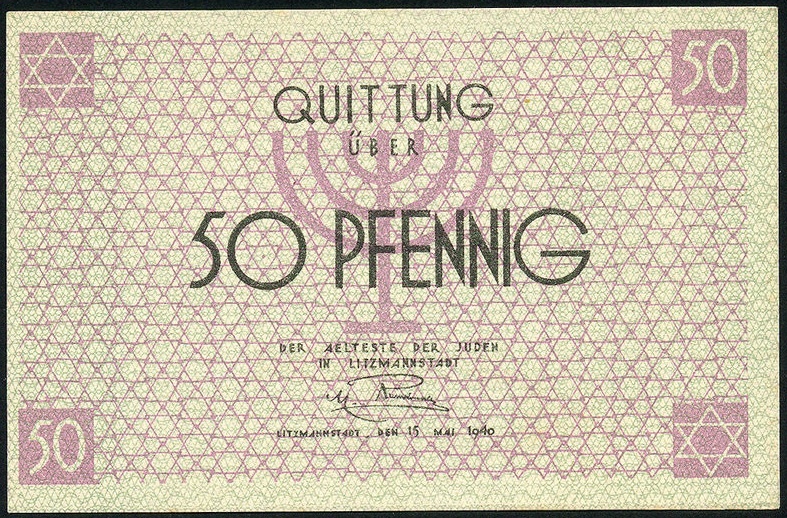 The identifying feature of the 50 pfennig note is a dot within the magen david that is found within the 0 of the number 50. The identifying feature of the 1 mark note is a small dot between the /M/ of “Mark” and the following /a/, level with the top of the /a/. The identifying feature of the 2 mark note is a similarly placed dot, level with the middle of the /a/. 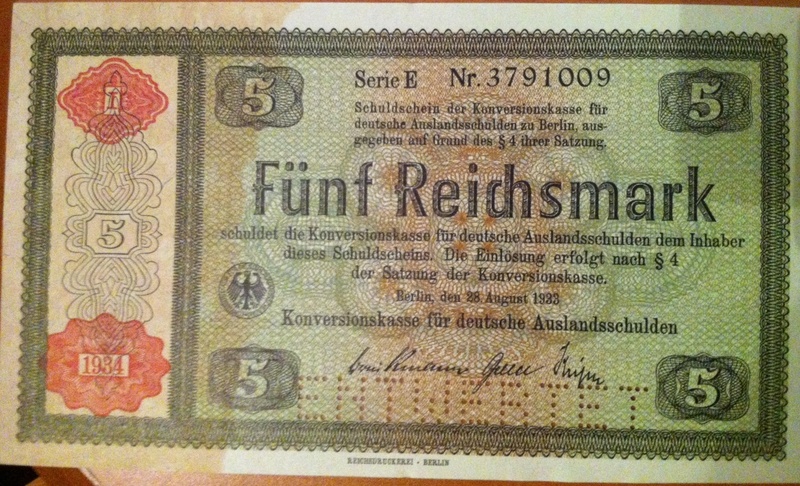 The identifying feature of the 5 mark note is a dot within the /k/ of the word “Mark”. 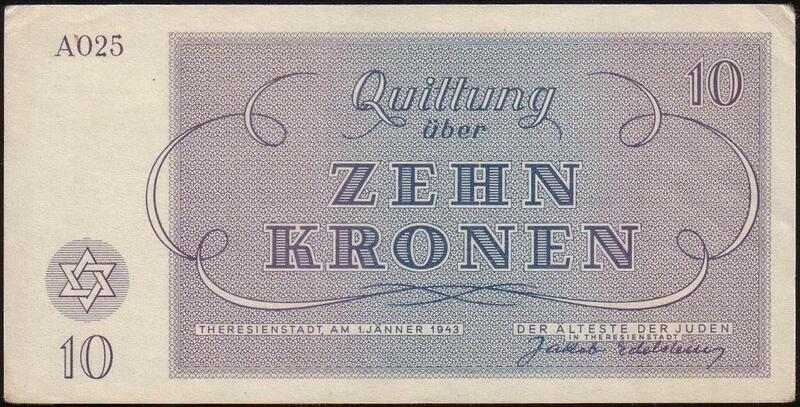 The identifying feature of the 10 mark note is a dot within the /h/ of the word “Zehn”. 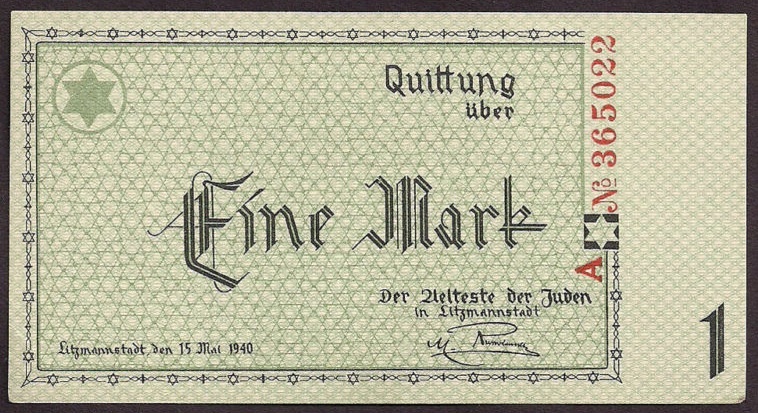 The identifying feature of the 20 mark note is a dot within the loop that is formed by the top of the initial /Z/ in “Zwanzig”. 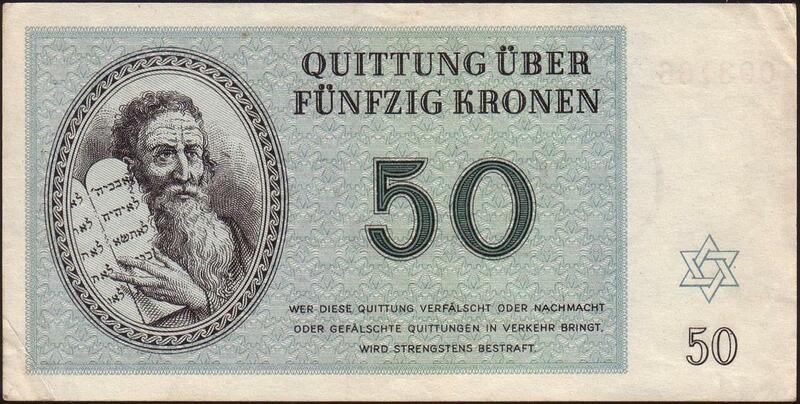 There is also a 50 mark note, but it is somewhat rarer and therefore more difficult to acquire. 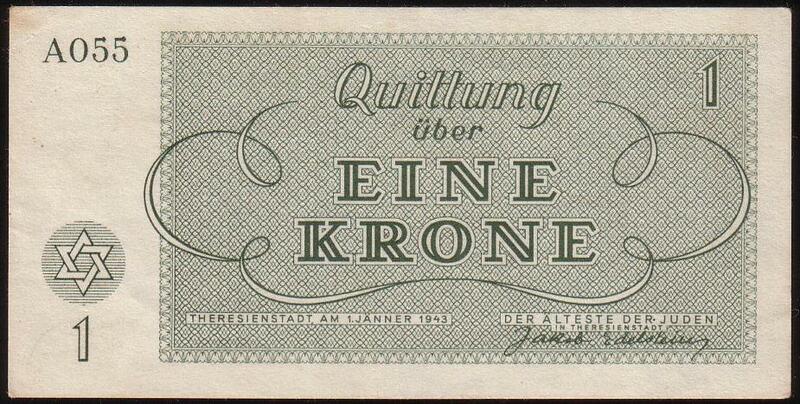 My final item is an example of a promissory note (Konversionskasse), to the value of 5 mark. 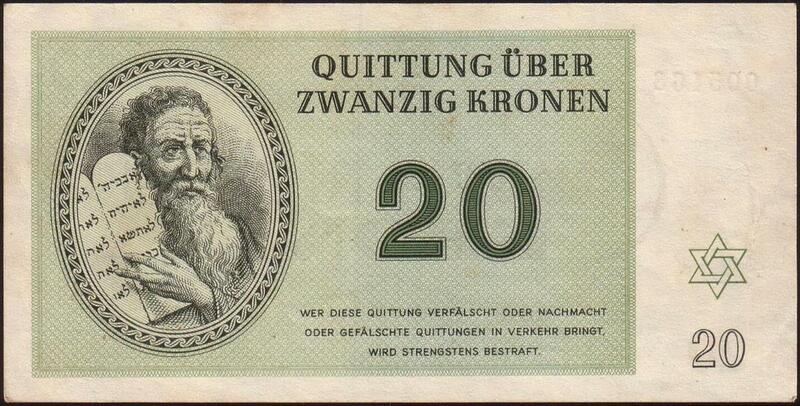 These notes were given to people (primarily Jews) who wished to move abroad and keep their money. After paying an exorbitant tax, the remainder of their wealth was transferred into notes of this nature, which they would soon discover were completely worthless. 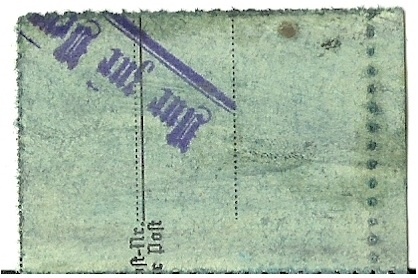 They are almost always stamped with WERTLOS (“worthless”) or with ENTWERTET (“cancelled”). I receive very mixed reactions from people when showing them my collection. While some are impressed with the connection to history that holding such items in one’s hands can create, others still are repulsed with the horror of it all, and uncertain as to why one might wish to acquire them. Myself, I have very mixed feelings. At times, I find myself drawn to them: they are something solid, tangible, real. They are silent witnesses in the true sense of the term, but even voiceless they speak louder than words. They testify to a period of utter hatred, and one that I remain uncertain of how to understand. 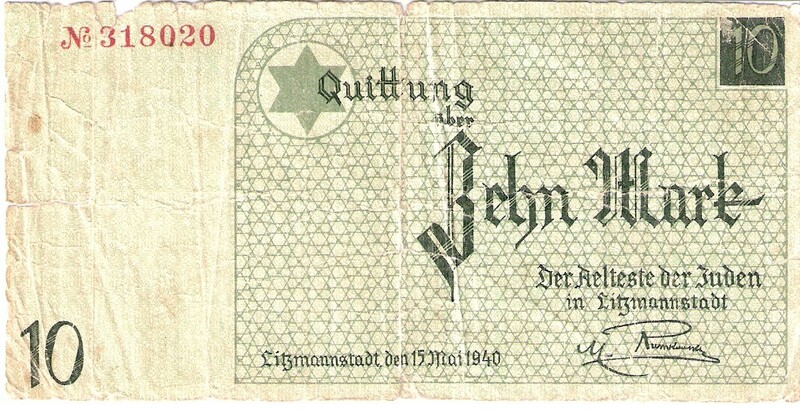 While the antisemitism of the Notgeld is connected, for me, with a long history of political antisemitism (itself predicated upon broader social and religious forms of Jew-hatred), the horrors of the Holocaust are exploitative of such attitudes, though not necessarily a natural development from the same. 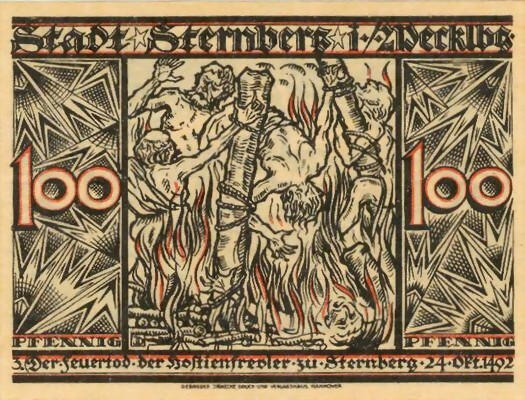 It is telling that the images on the antisemitic Notgeld are all either set in the distant past, centred on usurers and profiteers (rather than explicitly “Juden”) or, in the case of the Golem from Frankfurt, offensive by association only. There is a yawning gulf that lies between the contents of the red folder and the green, and while the items in the two folders interest me, challenge me, repulse me and inspire me, it is that gulf that I find most worthy of deliberation. Exceptional. Just brilliant. Your writing and insights are a highlight of my reading. Well done. i’m glad that these things are held by you. Thank you for making people think. Thank you, Tony! There is also a Brakel in Belgium, and I got confused between the two. 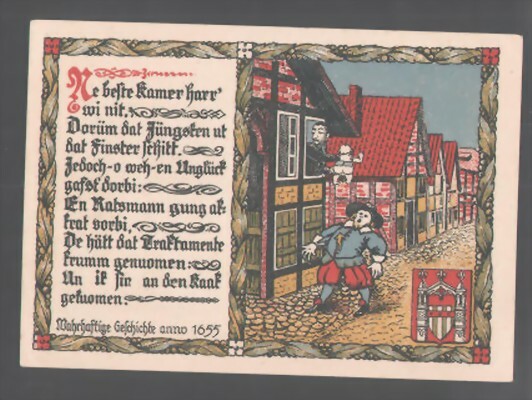 just something to add , aboat the 1921 frankfurt note , it says : “GOLEM” wich means – the golem of prague , its from “KABALLA” , so its defenetly anti semitic. 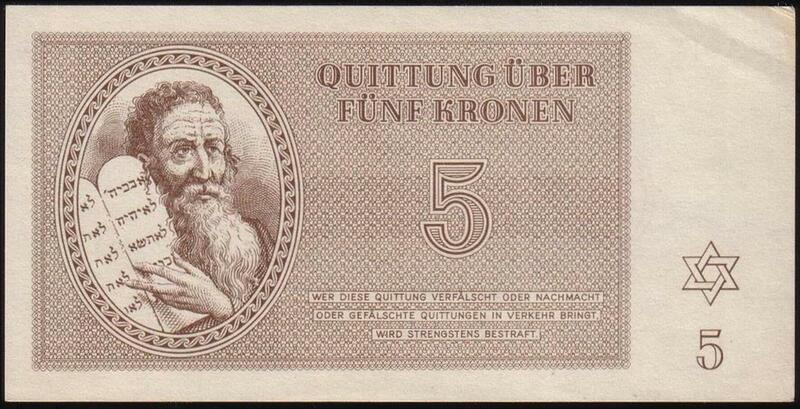 i want this banknote so much but cant find it anywhere !! 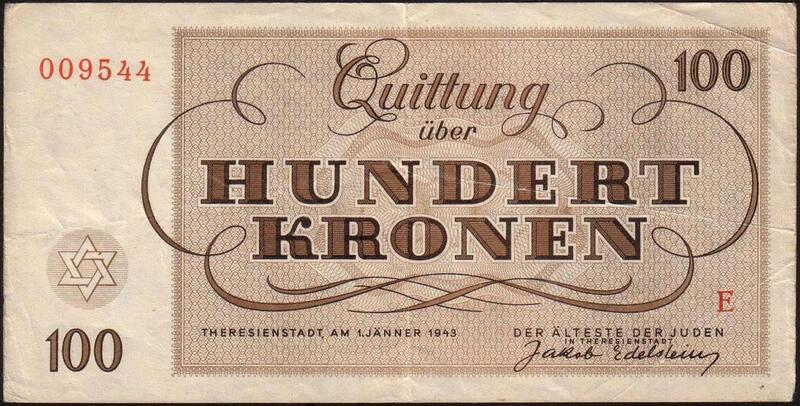 i have almost all the banknote that you have , very nice collection you have. 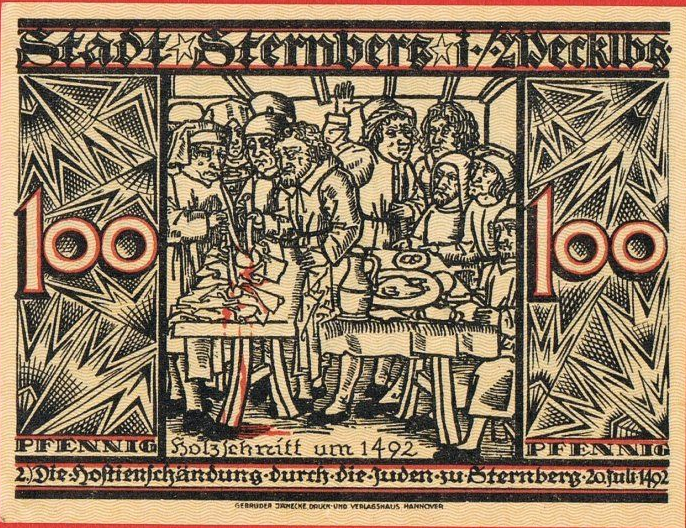 can you tell me how much you paid for the frankfurt note and how much for the series of 1492 sternberg ??? thanks , and shalom from israel. Thanks, Nir. I bought most of these on eBay, although in some instances had to look around elsewhere. I collected the Sternberg series from two places: notgeld.com and germanwarfilms.com. Be wary of the former site! They have some very nice pieces from time to time, but they are extremely overpriced. Better to find someone on eBay who collects them, and see what they can do for you. 1- hope i was helpful to you aboat the frankfurt note , you wrote:”Unlike the other items, there is nothing overtly antisemitic “. it is defenetly antisemitic regarding the “golem” thats is printed on the left side , as i said , from “kaballa”. 2- you didnt tell me how much you paid for the frankfurt and the 1492 series. i just want to know the value , i dont want to pay to much. 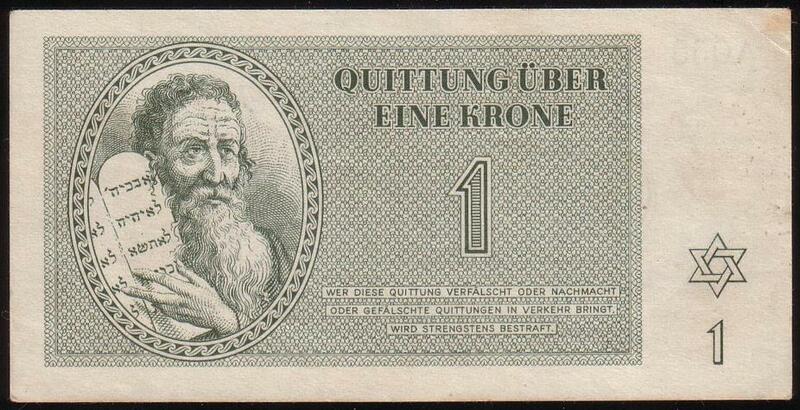 for example , for 1 note from the 1492 series a seller want 8 euro !! it seems a bit high. what do you think ? So far as the price is concerned, I regret that I don’t remember. My guess is that I would have paid about $30AUS for the Frankfurt note, and probably somewhere in the vicinity of $90AUS for the Sternberg series. 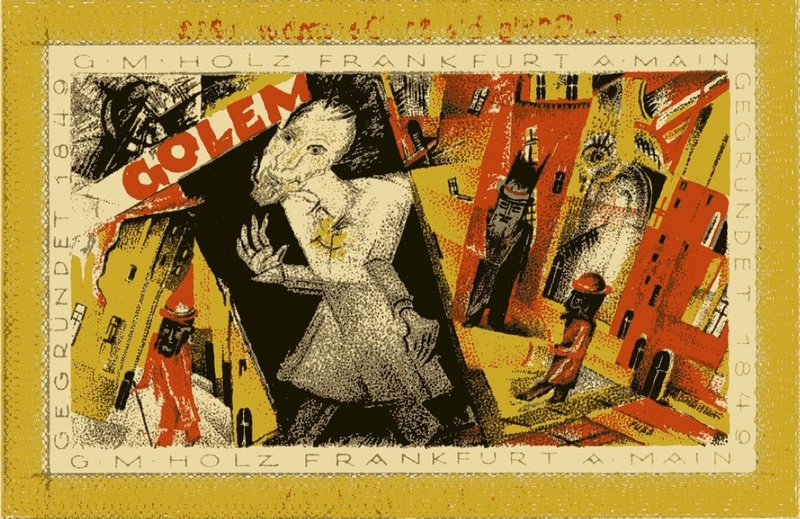 As for the image of the golem, you are correct when you say that it has certain connections to the kabbalistic tradition (although the golem mythology originates in the Talmud), but that’s not enough in-and-of-itself to say that it is “antisemitic”. Since acquiring these pieces, I’ve probably doubled my collection. In the process, I’ve added to it notgeld with very prominent magen davids, kiddush cups and tablets of the law. 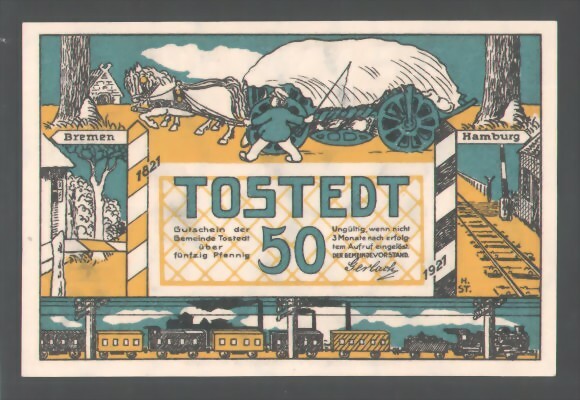 Some of those were actually printed by hotels with Jewish owners, in places like Norderney and Görlitz. 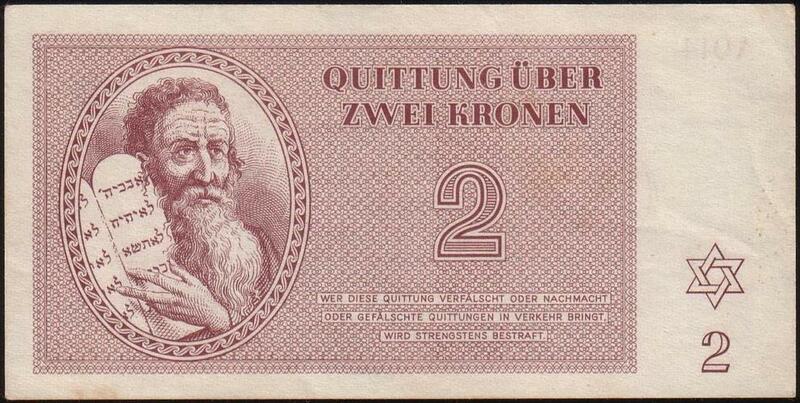 The nature of Jewish iconography in German and Austrian notgeld is extremely complex. From those that I have seen, it appears that the material of an antisemitic nature is overtly so, leaving no question as to the intentions of the artist. So far as I am concerned, therefore, the jury is still out on the Frankfurt piece. It’s in the style of the impressionists, which itself could be either a good or a bad thing, depending on how the artist felt about that mode of art (some referred to it as degenerate, while others praised it highly). There are horns on a bearded figure in the background and some of the faces are dark, all of which might indicate a certain maliciousness. But then, that’s all I have to go on. 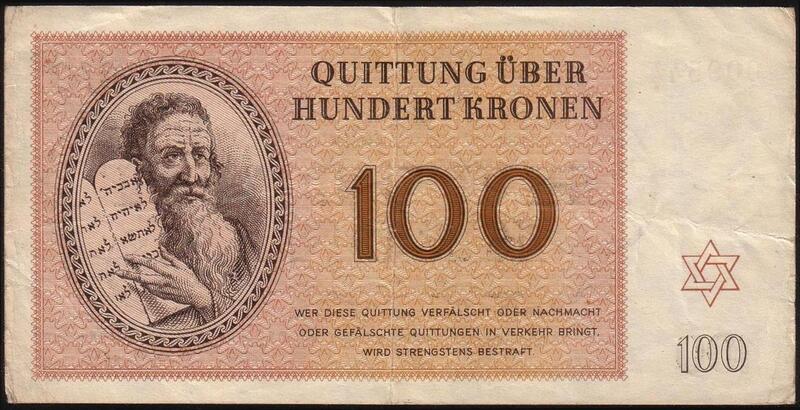 as a collector , and after searching over 15.000 pieces of 1921-1922 netgelds (even talking with sellers around the globe) i can say for sure that the estimate value of the frankfurt note is between 80 euro to 200 !! its very rare now , and its the most beautifuly artistic piece. i hope i will get it for 20 to 30 euro , but i dought it. regarding the 1492 series the value is aboat 50 to 100 euro. sentimenaly it has no value to me , its beyond any price , but still they are highly collectible. all i can say , i envy you for having the frankfurt piece , and i wish to get my hands on 1 piece for my own soon. Best of luck! I look forward to hearing good news. 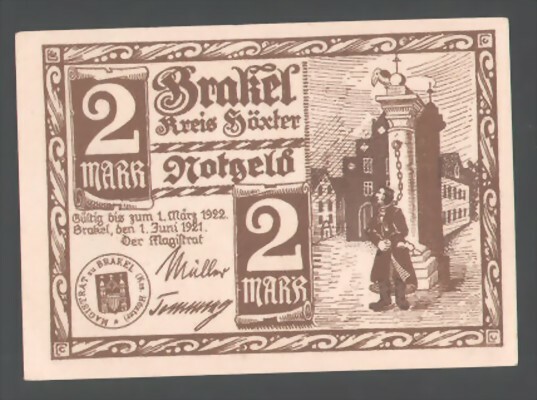 The Frankfurt note was one that I purchased on eBay, although I seems that I may have been luckier with it than I realised. A seller whom I would recommend is Alex Hirsch Collection. I have purchased several items from them. i visited the hirsch page , he is very expensive. notes that i have bought for 20 euro he is selling for 50 ! i can only imagine what will be the price for the frankfurt note if he had one , i belive something around the 70 to 120 euro. 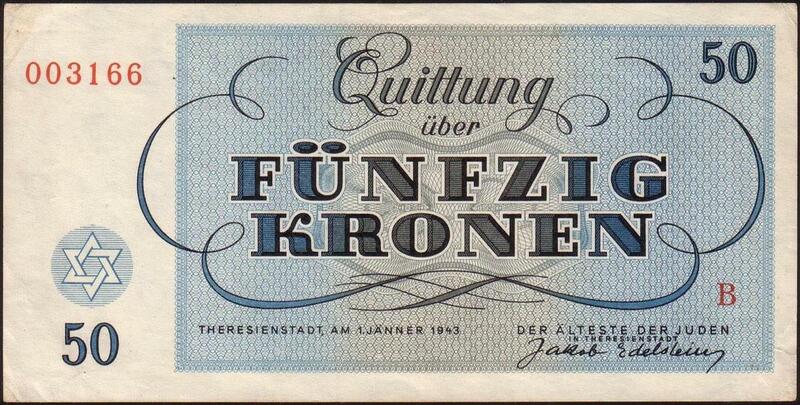 i got the frankfurt notes !!!!!!!!!!!!!!!!!!! i m so exited man ! they are wonderful !!! i got the 25 + 50 wolf eck and the 25 + 50 golem. the seller wanted 160 euro + 25 euro shipping , i got it all for 150 , aboat 35 euro a piece ! 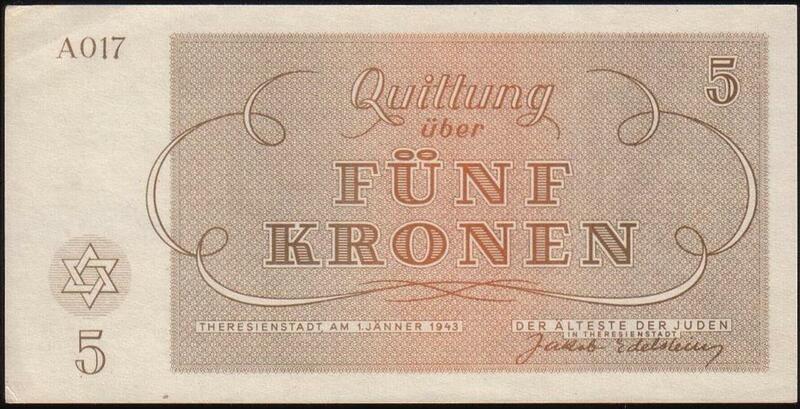 i would like to show you pics of all the banknotes i have but i cant upload pictures as a respond. That’s excellent, well done! I just acquired a very rare piece myself (which I hope to write about at a later date)… You can email me pictures of yours, if you like. My address is simon at benabuya dot com.